We describe a case of a 77-year-old male who underwent transcatheter aortic valve implantation (TAVR) with Edwards SAPIEN XT size 26 mm for severe aortic stenosis. Postprocedural transesophageal echocardiography (TEE) showed left-to-right shunt between the left ventricular outflow tract just below the bioprosthesis and the right atrium across the atrioventricular septum (Gerbode defect). Three-dimensional echocardiography (3DE) allowed a detailed anatomical imaging of the shape and the location of a small, circular, atrioventricular defect that was a type II, direct, supravalvular, Gerbode-type defect. This is the third report of a Gerbode defect after TAVR whose diagnosis has important implications on clinical decision-making. TEE plays a key role; its diagnostic ability is enriched by the additional value of 3DE. Transcatheter aortic valve replacement (TAVR) is a new and transformational procedure that has emerged as an alternative to surgery in patients with severe aortic stenosis, who are at intermediate, high, or prohibitive risk for a traditional surgical aortic valve replacement. Despite its many advantages, TAVR is associated with some unique procedure-related complications such as coronary obstruction, valve migration/embolization, aortic root rupture, and ventricular septal defects (VSDs), all of which can be fatal.,, Left ventricular-to-right atrial communications (the Gerbode defect) are the rarest types of VSD complicating TAVR., An accurate anatomical and functional assessment has a crucial importance in clinical decision-making. Echocardiography (E) plays a key role not only in diagnosing TAVR complications but also in allowing a detailed three-dimensional (3D) anatomical imaging. We describe a case of a 77-year-old male who underwent TAVR with Edwards SAPIEN XT size 26 mm for severe aortic stenosis. A postprocedural transesophageal echocardiography (TEE) showed an abnormal color flow during systole between the left ventricular outflow tract (LVOT) and the right atrium (RA) [Figure 1]a, white arrow]. 3DE allowed a detailed anatomical imaging of the shape and the location of a small (size 0.4 cm × 0.5 cm), circular, atrioventricular, defect that was a type II, direct, supravalvular, Gerbode-type defect, from both the LVOT [Figure 1]b, white arrow] and RA views [Figure 1]c, white arrow] of the membranous atrioventricular septum with perspective en face. 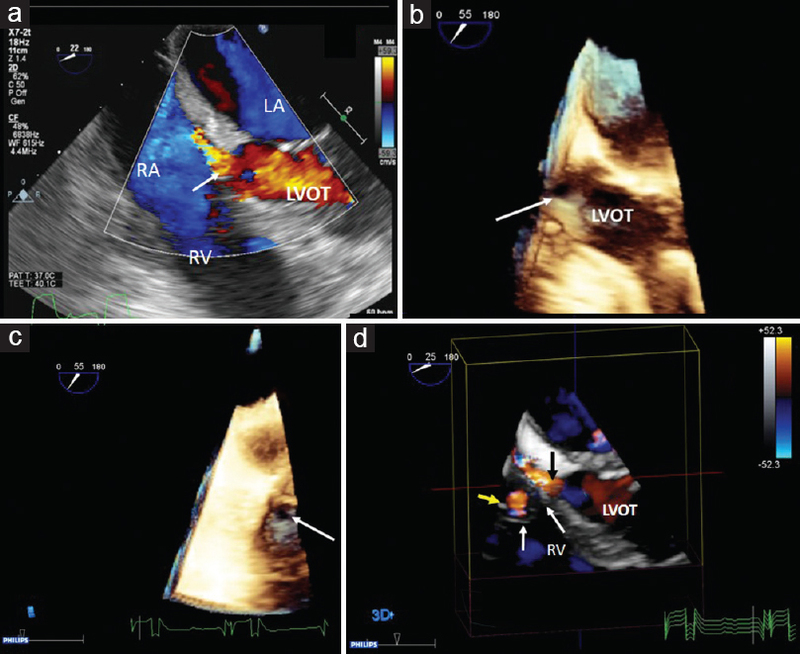 3D color Doppler echocardiography [Figure 1]d and [Video 1] clearly allowed to distinguish the left-to-right shunt (black arrow) from the tricuspid regurgitant jet (yellow arrow) and the leaflets of tricuspid valve (white arrows). Continuous-wave Doppler across the defect showed a peak gradient of 96 mmHg; the aortic valve bioprosthesis demonstrated optimal gradients. Left and right ventricles were normal in size and function. Periprocedural angiography showed asymmetrical and delayed expansion of the valve, and it was not able to correctly identify the shunt [Video 2]. Following TAVR, the patient developed a complete atrioventricular block and required pacemaker implantation. With the absence of heart failure symptoms and hemodynamic findings of RV overload (normal RV size and function, normal pulmonary artery pressure, mild tricuspid regurgitation, and QP/QS 1.1), he was treated medically and he remained stable at 8 months of follow-up. Procedure-related VSD is a known complication of TAVR; however, it remains poorly defined. Development of a membranous VSD after TAVR carries a high mortality, and the optimal management strategy remains unclear. Reported treatments have included percutaneous closure, surgical repair, and conservative strategies, keeping in mind that smaller shunts even though may be tolerated for a time, in a longer term, follow-up might reveal progressive clinical deterioration.,,,, With the growing number of TAVR, it is important to recognize this complication procedure related. The location of VSD is adjacent to the valve landing zone, in the membranous or perimembranous part of the septum. Possible mechanisms involved could be a direct compression of calcification into the membranous septum, oversizing of the prosthesis, heavily calcified aortic valve leaflets, and a narrowed, calcified, or oval-shaped aortic annulus. In our case, there was an asymmetrical and delayed expansion of the valve due to a likelihood different degree of calcific degeneration of the two emi-annulus with the side of the right perimembranous septum less expandable; as a result, it might have favored the formation of the Gerbode defect as reported in literature. The defect of membranous septum can be divided into two types as follows: ventricular and atrioventricular. In fact, the membranous septum is divided by the septal leaflet of the tricuspid valve, apically displaced as compared to the mitral valve, into two different parts as follows: the interventricular and the atrioventricular. Left ventricular-to-right atrial communications (the Gerbode defect) are rare types of membranous VSD and are classified into two types as direct or indirect. Type I or indirect type is a perimembranous VSD whose shunt is from left ventricle-to-right ventricle then through the tricuspid valve into the RA. Hence, the defect occurs below the tricuspid valve, and the communication is indirect because the shunt arrives to the RA passing through the right ventricle and the tricuspid valve. This is referred to as an indirect left ventricular-to-right atrial shunt. Type II or direct type is the so-called true Gerbode defect; the blood from the left ventricle goes directly, through the small area of the atrioventricular membranous septum, to the RA. This communication is, therefore, direct and above the tricuspid valve and is rarer than the indirect one.,, Echocardiography plays a key role allowing the diagnosis by detecting the shunt; otherwise, the correct description of such a complex anatomy is difficult, and it was reported to be possible only by using 3D computed tomography. At the best of our knowledge, only two cases of Gerbode defect have been reported as complication of TAVR. An accurate anatomical and functional assessment has a crucial importance in clinical decision-making. Being mindful of this complication is important, and the echo study should be focusing not only on the bioprosthesis and LV cavity but also on the interventricular septum, taking care also to not misinterpret the color flow shunt of the Gerbode defect seen in the RA with the tricuspid regurgitation jet. In fact, both are systolic and can have the same direction. In our case, 3DE clearly differentiated the different flow. In conclusion, this is the first report using 3DE imaging for the final diagnosis of a Gerbode defect after TAVR. TEE plays a key role in cardiac transcatheter procedures, and its diagnostic ability is enriched by the additional imaging value of the 3DE. Arora S, Misenheimer JA, Ramaraj R. Transcatheter aortic valve replacement: Comprehensive review and present status. Tex Heart Inst J 2017;44:29-38. Ando T, Holmes AA, Taub CC, Slovut DP, DeRose JJ. Iatrogenic ventricular septal defect following transcatheter aortic valve replacement: A systematic review. Heart Lung Circ 2016;25:968-74. Sardar MR, Khan ZA, Abraham A, Saeed W, Farhan M, Kolte D, et al. Management strategies and possible risk factors for ventricular septal defects after transcatheter aortic valve replacement: Case series from a single center and review of literature. Cardiovasc Revasc Med 2017;18:462-70. Hahn RT, Kodali S, Tuzcu EM, Leon MB, Kapadia S, Gopal D, et al. Echocardiographic imaging of procedural complications during balloon-expandable transcatheter aortic valve replacement. JACC Cardiovasc Imaging 2015;8:288-318. Rojas P, Amat-Santos IJ, Cortés C, Castrodeza J, Tobar J, Puri R, et al. Acquired aseptic intracardiac shunts following transcatheter aortic valve replacement: A systematic review. JACC Cardiovasc Interv 2016;9:2527-38. Jacobs JP, Burke RP, Quintessenza JA, Mavroudis C. Congenital heart surgery nomenclature and database project: Ventricular septal defect. Ann Thorac Surg 2000;69:S25-35. Tidake A, Gangurde P, Mahajan A. Gerbode defect-A rare defect of atrioventricular septum and tricuspid valve. J Clin Diagn Res 2015;9:OD06-8. Silbiger JJ, Kamran M, Handwerker S, Kumar N, Marcali M. The gerbode defect: Left ventricular to right atrial communication-anatomic, hemodynamic, and echocardiographic features. Echocardiography 2009;26:993-8. Riemenschneider T, Moss A. Left ventricular- Right atrial communication. Am J Cardiol 1967;9:710-8. Watanabe M, Taguchi T, Katayama K, Imai K, Taijiro S. The gerbode defect diagnosed by 3D reconstructed cardiac computed tomography. Eur Heart J Cardiovasc Imaging 2017;18:762.